Sir Ben Ainslie's dream of winning the America's Cup is over for this year. Despite winning one of tonight's three races it was not enough to overturn the lead by New Zealand. The Portsmouth based Land Rover BAR team could not match the boat speed of their rivals. But Ainslie has vowed to continue his bid to bring the worlds oldest sporting back to Britain. Sir Ben Ainslie's bid to win the America's Cup has suffered a major blow today. The Portsmouth-based team broke part of their wing during the first of their semi finals. Land Rover BAR were forced to retire from both of their races this evening. It gives their rival New Zealand team a two-nil lead. The first team to five wins goes through to the challenger final. Ainslie's crew are due to race again tomorrow if they can repair the damage. 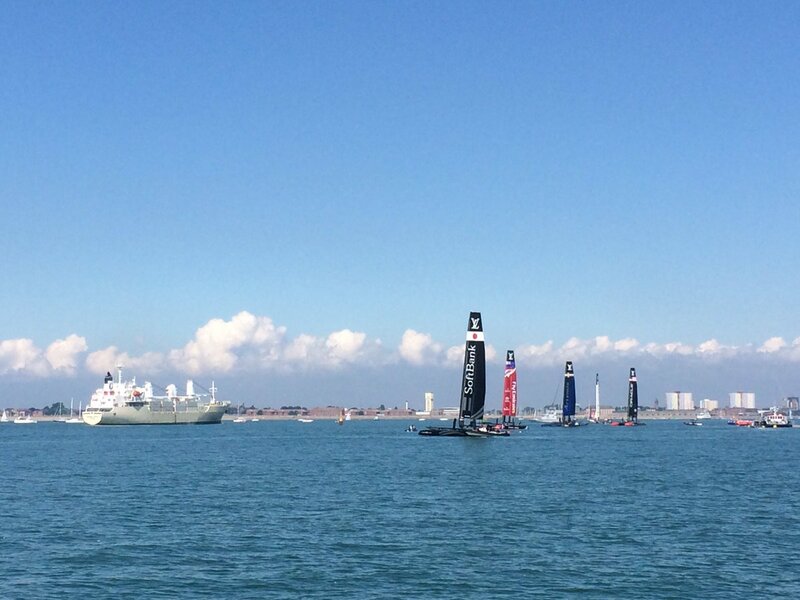 Successful first day for America's Cup - will it continue? The first day of racing at the America's Cup in Portsmouth saw huge crowds watching the action on the water as Sir Ben Ainslie's team Land Rover BAR won two out of the three races in the summer sunshine. Speaking before the three official races began, Sir Ben Ainslie said: "Other than actually winning the America's Cup, this is by far and away the biggest deal for us. Winning last year in front of guys was incredible for all of us. That's why we compete; we want to do it in front of our home crowd. It looks like great racing and we're going for it!" The Blades aerobatic team put on a stunning aerial display at 12pm and racing then kicked off at 1.30pm. The first race proved to be a tough start for Land Rover BAR, with a photo finish seeing them end in fifth place. The team regrouped and then stormed to victory in races two and three to applause and cheers from the home crowds waving Union Jack flags. Sir Ben gives Portsmouth something to cheer about! The hero of the home crowd certainly gave his fans something to cheer about yesterday. Sir Ben Ainslie won the first day's racing of the America's Cup World Series in Portsmouth in front of tens of thousands of spectators. Former Wimbledon Tennis champion Maria Sharapova took to the water to see Great Britain win the day - Sally Simmonds was watching. After a modest start, Sir Ben Ainslie's Land Rover BAR team managed to claw it back to win the next two races in today's sailing of the America's Cup. The tournament is being held at Portsmouth, just around the corner from where Ainslie's new training facility was built in Old Portsmouth. And Ben Ainslie wasn't the only familiar sporting face at the event this weekend - tennis star Maria Sharapova also took to a boat to watch the sailing action up close. The America's Cup is the biggest prize in world sailing and racing in the World Series began in Portsmouth this afternoon. Sally Simmonds has been meeting visitors and racers. Today is practice day of the America's Cup World Series. Thousands of people - including Sir Ben Ainslie and his team - are in Portsmouth. Our reporter, Sally Simmonds, is there. Now, if the city of Portsmouth had any doubts about the economic impact of being the home of Sir Ben Ainslie's dream to win the America's Cup - this week they got reassurance in abundance. Figures show the team - plus the World Series Event - in July - will bring in over one hundred million pounds. This fast and furious racing is captivating the crowds - and therefore bringing in the cash. Sally Simmonds has caught up with Sir Keith Mills, Chairman of Portsmouth ACWS Event, Sir Ben Ainslie and Freddie Carr, crew of Land Rover BAR.